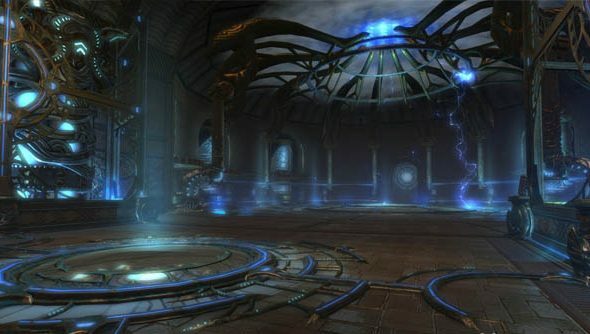 Storm Legion, Rift’s first expansion, is going to come with player housing. Only it’s not just player housing, but an entire sandbox of tools to build and create the perfect living space: something that’s entirely unique to you. Trion just couldn’t stand to do what everyone else was doing, so they decided to do one better. And when Trion says build, they really mean it. With an interface that really isn’t all that far off something from Second Life, you can drop specific Dimensions items into the game, and once they’re placed you can move them about, rotate them and resize to your heart’s content. It means that you’ll be actually creating your house, if you choose to, out of blocks you either craft or find in the world. “Storm Legion will be shipping with hundreds of items,” Karras continues, “and we’ll be constantly updating on that.” Hundreds means that it won’t all be wooden planks and nails. Potted plants, giant rocks, lamps and candelabras, even Dragon Eggs were all available in the build we were given to play around with, and they allowed you to go straight for the surreal. With a larger inventory, the possibilities start to reach Minecraft levels. Despite the creativity of the unorthodox use of basic household supplies, it’s the hull of the boat itself that catches my eye. Not only is it made up of individual pieces, some of which are benches and tables, but the majority of the hull uses the standard wooden tile. Only it doesn’t look like it’s made up of many tiles; it looks like it’s one seamless bit of wood. And that’s one of Dimensions sneakiest, and smartest, tricks. Certain items, such as rocks, boulders, and building tiles, will use ‘World Shaders’, which means that as they move around the area, the texture shifts. It’s as if they’re just windows into some other layer of the world, where it’s just rock, or grass, or wood. When you place two of these items together, where they meet is just a shared texture point, and the join is seamless. There’s no repeated texture, and no clear divide between the two. This lets you create vast structures that don’t fracture into their component parts the instant you get close. The implications are pretty exciting, especially for anyone who gets frustrated by that same blip appearing on any surface in games a thousand times. You create something and you want it to look excellent, and that’s what this allows. “We give players a whole lot of tools, and they need to be easy to use.” Karras interrupts my train of thought, and then shoves a bunch of journalists in front of the Dimensions toolset, a sure bet to test any ‘ease of use’ theory. It turns out they’re right. Within fifteen minutes I’ve got a handful of giant boulders suspended in the air over the lagoon, a few bits and pieces littering each. It might even look good, if you squint. They’re not limiting the options to just building, though. You’ll also be able to set the tone of your Dimension, using both sound and light, through music machines and skyboxes. Throw either a music box down or a telescope and the mood of the area suddenly shifts, jungle pipes blasting out and the entire sky darkening to a canopy of stars, complete with astrological drawings. It’s the Conquest map, and the music from one of the jungle zones. It’s important, because Dimensions aren’t intended to be a solitary affair. Setting the tone lets you cater the experience for those people coming in, whether they be friends or strangers. Trion wants Dimensions to be something you can share, if you want to. Guilds which will have their own Dimensions, with higher item limits. Potentially higher population caps, too, although they’re already set at 200, which is pretty hefty. This is a tool that is separate from the main game of Rift, but entirely something that you can spend a huge amount of your time on. So often in MMOs you feel like you’re struggling to make your mark, and set yourself apart from so many other players, but here you’re going to be able to create something unique. And people can come in and see it, admire how you’ve mounted the head of one of the God-Dragons on your wall, or created a giant treehouse with a diving board into the giant swimming pool in one of the other Dimensions. Or you could just ignore it and get back to killing monsters and getting loot. As Scott Hartman said in our interview with him, it’s all about choice.